We had a UFC 73 party at our place on Saturday so to make lunch easy Mr. Pikko bought a Costco chicken for the kids while he was buying food and supplies. The food was great, in addition to the edamame and pipi kaula, we grilled 3 kinds of hotdogs (1 pack of monstrous dogs courtesy of teh Gonz) on my Foreman grill and thanks to a tip from a co-worker, I was actually able to clean it easily this time. Teh Gonz also brought this awesome crab dip, Phil brought mochi rice, Sean brought some Popeye’s, and Shawn brought ahi limu poke. Obviously no one knows who Gonz, Phil, Sean, and Shawn are but I mention them as a thanks for bringing foods. The fights were not bad, though they could have been better. Anyway, Shawn’s leftover poke is what I made for lunch today so that it wouldn’t go to waste. I’ve never tried the limu one from Foodland before so I’ll find out today what fried limu tastes like. (limu is string seaweed) I cut up the leftover Costco chicken this morning and fried it with the rice I’d made for the curry Sean brought from Popeye’s and furikake. I added the shoyu bottle in case I didn’t season it enough but since Buddy ate it for breakfast no problem, maybe I won’t have to use it. 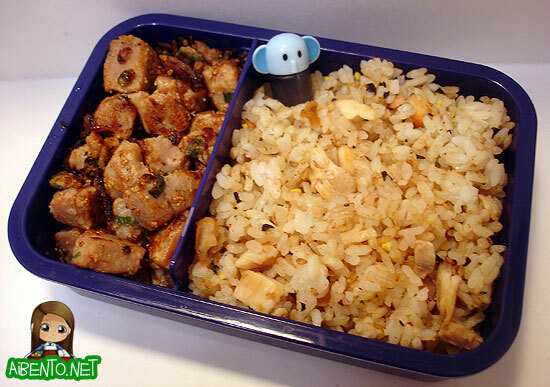 I will likely only be posting 3 bentos this week as I’m going on a trip to LA on Wednesday for E3. I’m not technically *attending* E3, but it’s why I’m going. It will be the first time I miss a weekday bento I think!! Oh noes! ; ; This trip should be a test for me to see how well I hold up to my diet without a fridge full of food that I’ve bought or cooked or portioned. Maintenance is still going quite well, I was 129.5 this morning. I don’t even really count points anymore, I just try to stay conscious of how much rice and fat I take in and it seems to work quite well. I’ve been well trained it seems!